Alkanet is a genus with some 30 species, belonging to the borage family (Boraginaceae). The genus is found from southern Europe to North Africa and as far as Iran. The root cortex of the species Alkanna tinctoria yields alkannin, the base ingredient for dyes and cosmetics. Alkannin is a naphtochinon derivative and is approved for use as a lipophilic food colourant. 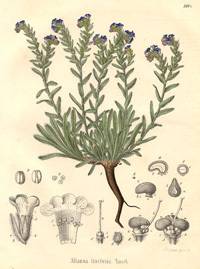 The blue-flowering shrub shown here grows in the Mediterranean region.